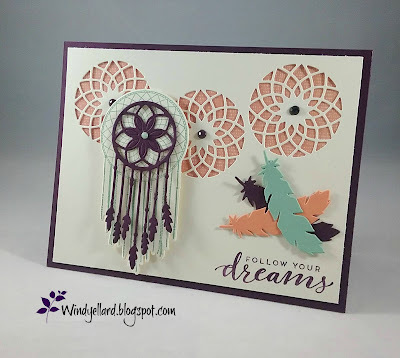 Fun card with great colors to show off this Follow Your Dreams bundle. I used Blackberry Bliss for the base and on top Very Vanilla card stock. Grapefruit Grove print behind. I placed Blackberry gems in the center. with the matching die and added a Blacberry die on top. I left some of the pieces in the die and added a Mint gem to the center. I finished with the sentiment on the bottom in Blackberry.